One of London Doctors Clinic‘s longest-serving GP’s, Dr Heschil Lewin, puts his Dermatology Diploma to the test, as we put to him some of our most frequently asked questions regarding Skin Health. From Acne, Eczema, and Rosacea to Anti–Ageing, whatever your skin concerns, our private GP‘s can advise! Spots usually cluster around the chin, jawline, nose and around the mouth. Acne usually occurs in teenage life, but can occur later in life – for example, around the menopause. These spots can be whiteheads or blackheads. What lifestyle changes can I make, to reduce my acne? First and foremost, it is important to keep the face as clean as possible to avoid breakouts of spots. Then, another step to improve skin quality, is to cut out alcohol and cigarettes, which can contribute to the development of acne. Finally, regarding food, the link between chocolate and acne is a myth! There is no evidence to suggest that eating or avoiding certain foods can help with acne. That said, just because there’s no clear evidence on a large scale doesn’t mean that if you notice certain foods help or aggravate your acne you shouldn’t follow your observations! If you personally find carrot juice helps your acne, keep drinking carrot juice! Good news – the link between acne and chocolate is a myth! So we can each as much as we like, right?! 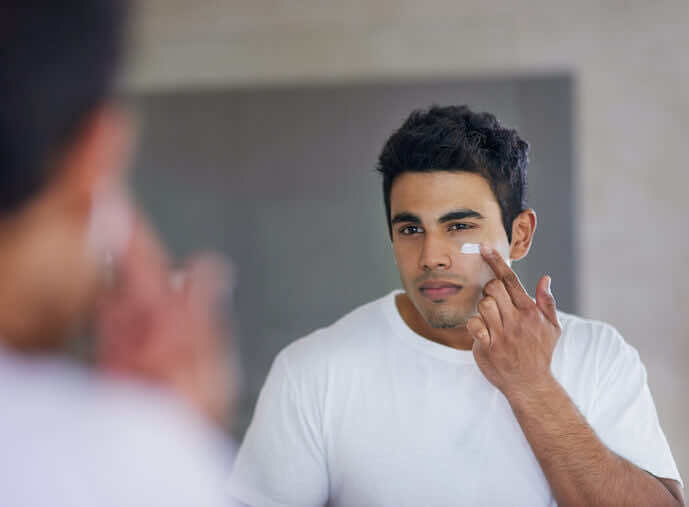 Acne is basically the result of a mismatch between the amount of sebum (oil) produced in the skin, and the opening of the pores – there’s too much sebum and the pores are closed, this leads to clogged pores in the form of blackheads and whiteheads. What can the GP prescribe to help with acne? The first step in treating acne would be to prescribe topical creams to open the pores up, such as Duac Cream. These usually contain peroxide to dry up the skin, and antibiotics to prevent infection. If this is insufficient, the next step in tackling acne would be to prescribe antibiotics, to be taken by mouth, such as Tetracycline antibiotics. Alternatively, for women, the combined oral contraceptive pill can be prescribed. Should these steps again not be sufficient in managing resistant acne, your GP can refer you onto a specialist Dermatology clinic for Roacutane treatment. I’m struggling to keep my eczema under control, what would you advise? The first tip for managing eczema is to avoid water as much as possible, such as by excess hand washing. Then use emollients as often as you can, as this will help to “seal the skin” and prevent infection. In cold weather, it’s advisable to wear gloves to protect hands from the cold, which will dry your hands out and increase the risk of cracking. Use steroid creams on eczema, of the right potency for you, as soon as you have a flare-up. There are also new creams available, such as topical Tacrolimus ointment, should emollients not be sufficient (as an alternative to prolonged steroid use in cases of moderate-to-severe eczema). I often have flush red cheeks, how do I know if this is Rosacea or just blushing? The main difference between blushing and rosacea is that rosacea is usually permanent, whereas blushing is intermittent and associated with nervousness or embarrassment. The main symptoms of rosacea include reddening of the face (the cheeks, chin, forehead), accompanied with a burning sensation. What treatment is available for rosacea? Although there is no curative treatment for rosacea, there are many different medications available for long-term management of the condition. These include various antibiotics, topical creams, as well as two new medications approved for the treatment of Rosacea, including a gel called Brimonidine tartrate. There are also laser and light treatments available, including IPL (intense pulse light) treatment, which have very good effects for treating rosacea – these are only available in the private sector. I’m concerned about ageing skin: can my GP help? Your GP can, of course, advise about anti-ageing and answer queries you may have, but the best option would be to provide a referral to private dermatologist. At a specialist skin clinic, there are a variety of services available to help rejuvenate skin, including cosmetic fillers, botox, micro-abrasion and acid treatment. So, there you have it – some of the most frequently asked skincare questions, answered by our very own in-house Dermatology specialist, Dr Heschil Lewin. If you need any further skin help, or indeed, any other GP services, why not book an appointment at London Doctors Clinic? With eight London clinics, we are never too far away when you need to find a GP!